Fish The Deep Charters offer helpful and experienced crew and cater for seasoned anglers and novices. The catamaran 'Careel' is a 10m custom and locally built vessel. It has a top speed of 37 knots. 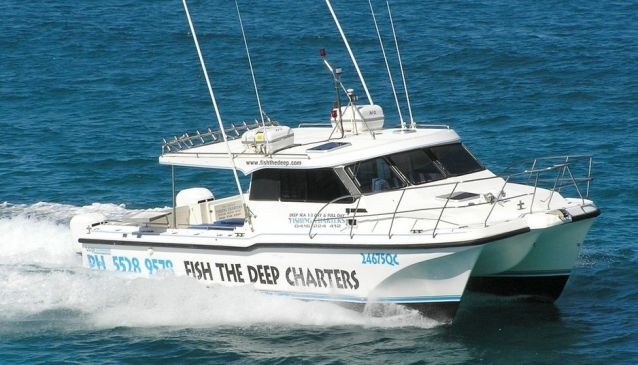 Fish The Deep Charters have a fishing platform larger than most and can cater for groups up to 12 in under cover comfort. 'Careel' is 34 ft long and powdered by twin 250hp yamaha. They provide meals and drinks to your convenience. When sightseeing on the vessel you may see whales, dolphins, turtles and loads of wildlife.